Chris can ONLY tattoo what is on his flash sheets so feel free to come by and look through his book! Can be in full color or black & grey - whatever you prefer! If you have any questions always feel free to give us a call at the shop! Say whaaaat?! Another guest spot is coming up! 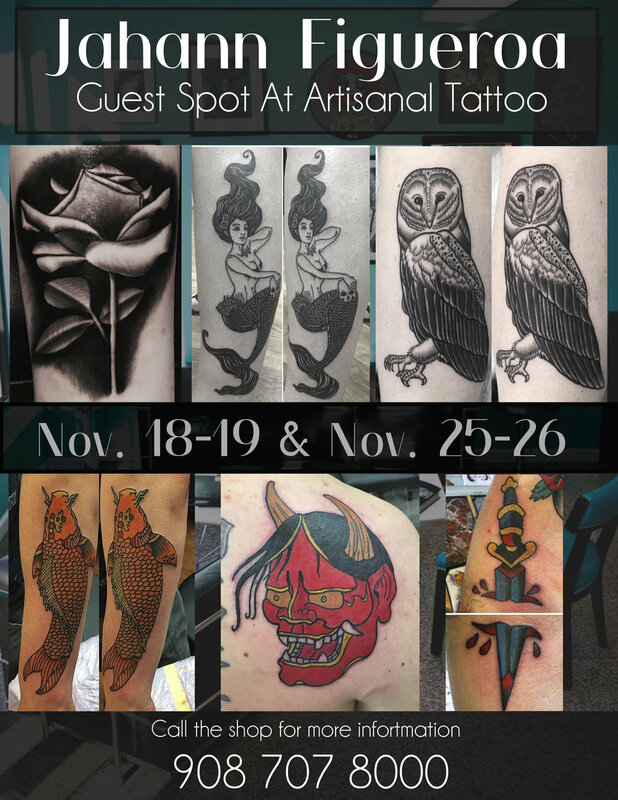 We're very excited to host Jahann Figueroa at Artisanal Tattoo from November 18-19 & November 25-26. Main interests include: Japanese, black and grey, and neo traditional styles of tattooing. Jahann is only here for a few days so come by or call the shop and book an appointment before they're all gone! Lou and Swift will be at the convention this year! They're accepting appointments up until October 1st so call the shop to set up a consultation! That's right! From October 14-16 Buddha will be guest-spotting at our shop! Israel Rojas, known as Buddha, is an Ecuadorian tattoo artist. He is bilingual, and speaks English and Spanish. He loves to work in different kind of media, and has been tattooing since 2014.Tattooing is his passion. This lifestyle has showed him more respect and responsibility than any other job. He is a clean freak, loves to joke a lot and make relationships with his clients so he can work more easily and provide great work. He's also a soccer fanatic! Click Here for more info on Elisheba! For the next 100 days, Leah will be donating $20 of EVERY tattoo done by her to the client’s choice of the ACLU, Planned Parenthood, or Safe & Sound Somerset!! Purchase a gift card over $100.00 we ADD an extra $20.00 to it!!! $200.00 + $40.00 = $240.00 AND SO ON!!! Piercing specials from now until the end of December at Artisanal Tattoo! Choose from any of the spectacular deals we have going on. Spend $60.00 or more on jewelry and that gets you ONE FREE PIERCING!! We're kicking off our annual gift card special a few weeks early this year! Come by the shop from today until Nov. 30th and pick up a gift card - for every $100 you get a free additional $25 added on!! Don't be a momo and miss out on this great deal! Fast Ali and Matt "The Pope" will be rocking all three days at the annual tattoo convention in Asbury!!! !